You can listen to a discussion Brian Lee Crowley had about The Canadian Century with Joseph Planta for The Commentary. You can hear Brian Lee Crowley on Madely in the morning on News Talk Radio 580 CFRA, between 8:30 and 9:00. Brian Lee Crowley will be on CTV’s Power Play with Tom Clark. Click here to watch the clip. 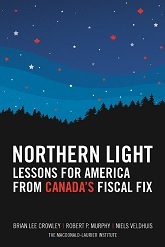 National book launch at Play in Ottawa, between 17:00 and 19:00. Click here to register for this event. Brian Lee Crowley will be on CJNI News 97.5 Radio – Afternoons with Tom Young, at 13:30. As part of the capital’s annual Tulip Festival, Brian Lee Crowley will be participating in a panel discussion in Ottawa on Canada’s changing values and institutions, with Andrew Cohen and Ron Caza. The event will take place in The Mirror Tent, Major’s Hill Park, Ottawa, between 19:00 and 20:30. GTA launch party in Toronto, at 17:00, an event sponsored by Bennett Jones and chaired by Allan Gotlieb. To RSVP, please click here. Brian Lee Crowley is scheduled to be on the LeDrew Live show with host Steven LeDrew, on CP24, at 21:00. Brian Lee Crowley is scheduled to be part of the 17:30 newscast on CHTV News. Brian Lee Crowley will be part of a panel on the Michael Coren Show, on CTS, at 18:00. Click here to watch the clip. Brian Lee Crowley will be on the Bill Kelly Show, on CHML Radio, at 11:30. Brian Lee Crowley will be on the Brent Holland Show, at 15:00. Click here to listen. Brian Lee Crowley will be interviewed on BNN – Squeezeplay, at 17:30. Click here to watch the interview. Brian Lee Crowley is scheduled to be on the Michael Harris show on 580 CFRA in Ottawa, at 14:00. Click here to listen. Brian Lee Crowley will be on the Ben Mercer show, on CFRB radio, at 17:00. Brian Lee Crowley will be on the Tommy Schnurmacher Show, on CJAD Radio in Montreal, at 10:00 am. Click here to listen. Brian Lee Crowley will be on the Dave Rutherford show on 16 June 2010 to discuss The Canadian Century. You can hear the interview here (click on June 16, 11:00 AM). Brian Lee Crowley will be a guest on “The Advocates” radio show along with co-author Jason Clemens to talk about The Canadian Century. Click here to listen. Brian Lee Crowley will be on CPAC’s Goldhawk Live to discuss the most urgent issue the G20 leaders should work on. Brian Lee Crowley will be on the KW Magazine on CKWR Radio, at 19:00. Brian Lee Crowley introduced more Canadians to The Canadian Century on one of Canada’s most popular weekly political radio shows… The House on CBC. In conversation with Rita Celli, Crowley provided an introduction to the Macdonald-Laurier Institute’s first book publication and a primer on why Wilfrid Laurier was just a 100 years ahead of his time when he said, “…it is Canada that shall fill the twentieth century.” You can hear the entire interview here (it starts at the 15:00 minute mark).